Oil on paperboard. 9.4cm x 7.5 cm. This striking miniature by Antoine Coypel, sold at Sotheby's in New York in 2007, and posted on Wikipedia in 2011, depicts Mohammed Reza Beg (or "Bey"), an ambassador from the Shah of Persia sent to the Court of the Sun King in 1715. 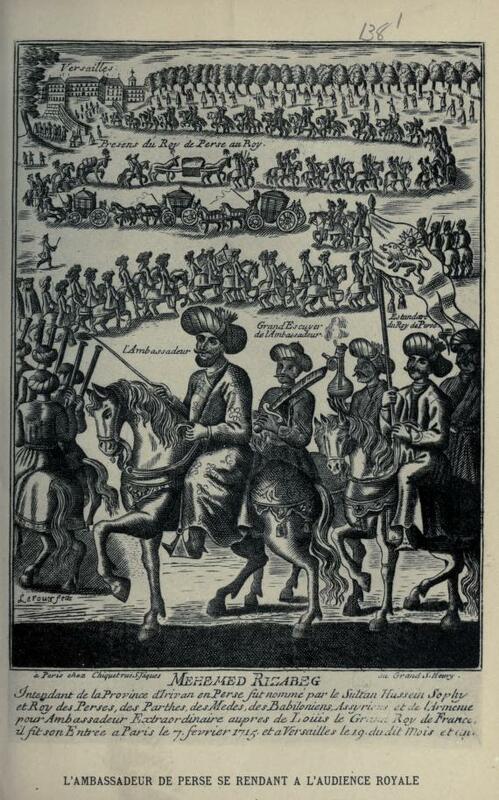 To early eighteenth-century Frenchmen Persia was a semi-mythical country which was almost impossibly far away. They had little information beyond the seventeenth-century merchants' tales of Chardin and Tavernier. Popular curiosity had been piqued by publication in 1704 of a translation of the Arabian Nights which, with its tales of eunuchs and harems, only further shrouded the Muslim East in a further aura of exoticism. Small wonder then that the ambassador's arrival caused a furore of excitement. Mohammed Reza Beg had been sent to France by order of Shah Sultan Husayn in order to seek French assistance against the Ottoman threat and against Arab pirates in the Persian Gulf. 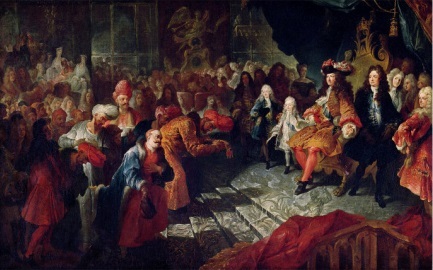 His splendid processional entry into Paris on on 7 February 1715 attracted great crowds and a painting by Coypel records his formal reception by the ailing Sun King in the Hall of Mirrors at Versailles. After a long audience, he attended a dinner in his honour and visited the little crown prince, soon to be Louis XV. The duc de Saint-Simon remarked that his gifts to the king were unimpressive and suspected that he was only a provincial dignitary putting on a show for his own ends. However, there is no reason to doubt his credentials and, though negotiations were slowed down by Louis XIV's ill health, treaties of commerce and friendship between France and Persia were signed on 13 August. As another result of the diplomatic mission, a permanent Persian consulate was established in Marseilles, main port for the French trade with the Orient. Sadly for Franco-Persian relations the ambassador acquired a reputation for extravagance and peculation. Having outstayed his welcome in France at some cost to the royal treasury, he was forced to go to Amsterdam to borrow money from Persian-Armenian merchants resident there, and finally spent all the kings gifts on his way back to Persia. His image was further marred by rumours of sexual impropriety, not without foundation, since he acquired a youthful mistress who escaped from the clutches of the French authorities to follow him on his long journey home. It is a story worthy of the Arabian Nights, but with a sad ending for it appears Reza Beg eventually committed suicide rather than face the displeasure of his master the Shah. "Sotheby’s Old Master sale on June 8, 2007 featured a number of exceptional French paintings. 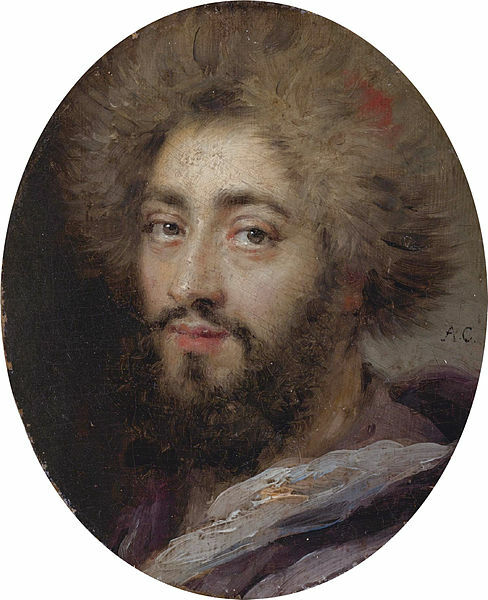 Everyone loved the tiny three-inch oval portrait of Mohammed Reza Bey, Persian Ambassador to France during the Reign of Louis XIV by Antoine Coypel (est. $20,000-$30,000). Sold in Paris in December 2005 as "attributed to Coypel" for €6,800 ($8,047), it was recently on offer at Salander-O’Reilly Galleries in New York for $18,000, and at Sotheby’s, it was bought by New York dealer Jack Kilgore for $57,000."